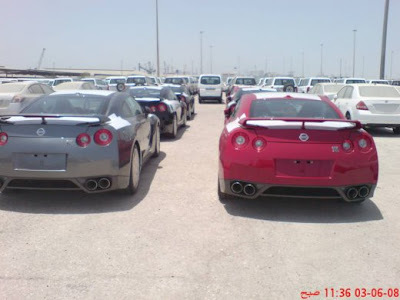 We have all seen the pictures of left hand drive R35 GT-R's already in the middle east. It raised speculation that the middle east was getting their cars before the US. According to this article , the cars are Nissans test cars. They have them in the middle east to test them in the middle eastern environment, prior to offering them for sale. "Nissan GT-R Chief Vehicle Engineer and Chief Product Specialist, Kazutoshi Mizuno, along with his team arrived specially from Japan to conduct several tests as part of the local assessment programme before the supercar is introduced to Middle East markets in early 2009. " Its funny how rumors and things get spread. Several people were telling me, that they were privately owned cars. A couple of pictures of cars being driven doesn't show me anything. There have been Japanese spec cars in the middle east since they were released in Japan.